JP Stewart and I are a team at the first 20 meter multi seat national glider competition. I arrived on Sunday to very stormy weather. The practice day was cancelled due to rainy weather. The first day was cancelled due to no lift, and an incoming thunderstorm. We had the chance to test out the water ballast system for QQ, calculating how much water we could put in it. Even though a few gliders launched on Monday, was threatened by incoming thunderstorms. Tuesday came and looked bad, but better than Monday. The task was assigned, and the fleet launched at 12:45. JP and i climbed in strong thermals following Karl Striedieck briefly. We left the start cylinder on our own at the first opportunity. We cruised under cloud streets to get to the first turnpoint. That's the crowd lined up behind us. In a matter of moments, the 4 knot thermals disappeared and were replaced by huge dark angry clouds rapidly approaching. After circling with two other gliders, we gave up, and had a landing strip picked out. The two other gliders were motor gliders. Those guys popped out their engines, and motored home. Since QQ is a pure glider, we landed at a private grass strip called Snook. After landing, JP went to look for the owner while I stayed with QQ. The rain started, accompanied with gusty winds. I got into the glider to keep it from blowing away. 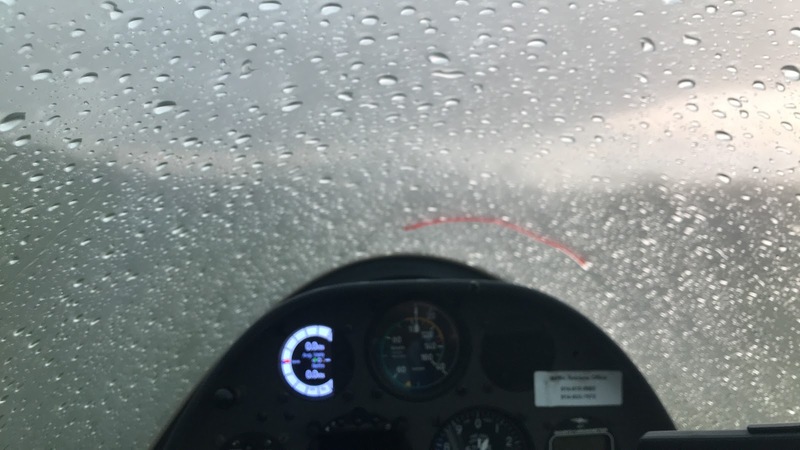 JP found a local resident who was watching the incoming storm on his radar, saw us land at the airstrip, and drove over to see if he could help. The best way he could help us out would to be to block the wind a little bit. I asked him to put his car in front of QQ's left wing to block it from the incoming wind, make it less tempted to fly away with a good gust. JP put some tires on the lower wing. I stayed in the cockpit with the parachute on and the belts strapped, just in case all of our measures didn't keep the glider from flying away. JP stayed in the car, dry. The rain came at its strongest at that point. A little bit of hail... Maybe pea sized. The whole time I was wondering if the hail was going to get bigger and start smashing the canopy. I was also wondering why I chose this sport. I kept left rudder and left stick and forward stick, and I popped out the spoilers when the gusts got stronger. The storm passed after what seemed like forever in that cockpit. After the storm passed, I got this picture. Frank Banas showed up with my pickup and the QQ trailer to retrieve us. What a sight for sore eyes! We scored pretty well, because everybody else landed out, too. Believe it or not, if Tuesday's scoring counts (which isn't likely, since only one team made it around the course) we could be in fifth place. I'm ready to do it all again today! Unfortunately, the rest of the week looks like terrible weather.